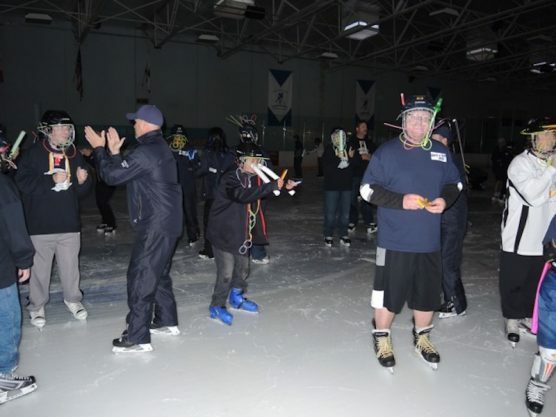 VALENCIA, CA – Friends, family and fans of special needs hockey gathered at the Ice Station Valencia this past Saturday to raise funds for SNAP Sports and the Valencia SNAP Flyers Special Needs Hockey Club. The 4th annual edition of SNAP Sports Skate-a-Thon raised over $38,000 for local special needs sports programming. The day kicked off with a special hockey exhibition with the SNAP Flyers facing-off against an all-star squad from the hometown Valencia “Junior A” Flyers. After a team luncheon, they turned down the lights and turned up the music at the Ice Station and over 60 skaters took to the ice in their best “glow” skate costumes. Participants competed for “Best Glow in Show”, and Valencia Resident Alex Oborne was declared the winner by a panel of judges comprised of the LA Kings Ice Crew! For more information about Skate-a-Thon 2016 and SNAP Sports, go to www.snaphockey.org.